West Bromwich Albion have signed out-of-contract Atletico Madrid defender Pablo Ibanez on a three-year deal. 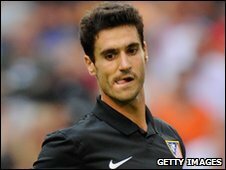 The 28-year-old Spain international has spent the last seven seasons in La Liga and will join Albion on 1 July. Baggies manager Roberto di Matteo told the club website: "Pablo has a great pedigree and is at a good age. "He also played in the Champions League for Atletico and the World Cup for Spain so the Premier League should hold no fears for him." Although he has had a lengthy career at the Spanish club, he made just seven appearances last season after falling out of favour with new boss Quique Sanchez Flores, who took over in October 2009. Ibanez becomes Di Matteo's third signing since clinching promotion to the Premier League, following the capture of Blackburn midfielder Steven Reid and Auxerre defender Gabriel Tamas.